just up the pike: will montgomery fund new transit, or build more roads? will montgomery fund new transit, or build more roads? Maryland's gas tax increase means it now has the most transportation funding in a generation. Will Montgomery County spend its share on transit to support its urban centers, or keep building highways? 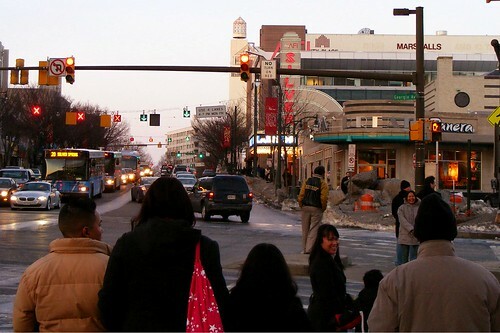 Walking in downtown Silver Spring. Photo by the author. Coupled with existing revenues, the new gas tax has made $15 billion available for transportation, a 52% increase from last year and the most transportation funding in a generation. This month, the County Council will send the state a list of their transportation priorities in order to receive some of that money. As in past years, there are a number of road projects on the list. But the Planning Board, noting the high cost of new highways and efforts to direct future growth to urban centers, urge the council to choose transit instead. Transit isn't "the answer to every transportation problem," they write, but "where roadway widenings to solve perennial traffic congestion would significantly affect existing communities, natural resources and parkland, a more efficient solution is needed." Not all of the projects on the list are likely to receive funding. But if they were, the county's transit network could expand dramatically. Some projects already have the support of county and state officials, including the Purple Line and Corridor Cities Transitway. Also included are funds for more 8-car trains on the Red Line, which will allow Metro to stop turning trains around at Silver Spring instead of running them to the end of the line at Glenmont. There's also funding to build three of the county's proposed BRT lines along Georgia Avenue, Route 29, and Veirs Mill Road, as well as studying future lines on Rockville Pike and New Hampshire Avenue. A proposed HOV lane on I-270 could eventually support transit between White Flint and Tysons Corner. Planners also recommend funding new sidewalks and bike paths along Georgia Avenue between Forest Glen Road and 16th Street, which the State Highway Administration is currently studying, and a pedestrian underpass at the Forest Glen Metro station. These projects would serve the county's existing urban centers, like Silver Spring and Bethesda, by giving people alternatives to driving. And they would support the development of future ones like White Oak, where County Executive Ike Leggett envisions a research and technology hub. But many of the road projects in the priorities list could undermine those efforts, whether by directing funding away from transit or by encouraging more people to drive there. The priorities list includes three interchanges along Route 29 in East County, at Stewart Lane, Tech Road, and Greencastle Road, which have been in planning for decades and would cost $344 million. (Maryland has already set aside $7 million to design a fourth interchange at Fairland Road, estimated to cost $128 million to build.) Under the county's traffic tests, they have to be built before development in White Oak can happen. County planners estimate that the three interchanges would cost the same to build as an 11-mile BRT line along the same corridor between downtown Silver Spring and Burtonsville. They say transit would not only better support the creation of a town center in White Oak, but give commuters from points north an alternative to driving, ultimately reducing local congestion. "We believe that prioritizing the [Route 29] transit corridor improvements is the better choice," their report says. Other road projects on the list include funds to build Montrose Parkway, a highway that would divide White Flint and Twinbrook. And there's a proposal to widen Norbeck Road between Georgia Avenue and Layhill Road and build an interchange at Georgia, even though the road runs parallel to the underused Intercounty Connector a half-mile away. Maryland's new transportation funds present a rare opportunity to the state and Montgomery County, its economic engine. Some road improvements may be necessary and beneficial, especially in the county's suburban areas. But the county's urban centers are where most of its future growth will happen, and they need transit to thrive. We have to make the right choice now, because we may not get it again for a long time. They should prioritize road improvements, not transit. Almost all Montgomery County residents rely on roads, some of us use transit, too. The money should be spent on transit vs. roads in relation to the percent of travel using transit vs. roads. Planners should stop proposing reducing quality of life in the county -- forcing people onto less convenient and more expensive transit -- just to foster more and more development, such as in White Oak. More density means more profit for developers, but it doesn't necessarily mean that the public is better off. To people who rely on transit, and to those (like me) who could drive but prefer not to, improving transit service is an improvement of quality of life. For people who live in White Oak, having more jobs and amenities close to home is an improvement of quality of life. It's all a matter of perspective. Clearly you disagree with the direction the county's going in. But one day you'll sell your house in Woodside Park, and I'll bet the people who buy it (and pay good money for it) won't be complaining that Montgomery County is hurting their quality of life with more transit and more amenities.